Crane scales have multiple applications in foundry and other industrial as well as non-industrial units. These crane scales are specially developed in different models to cater from 1 ton to 100-ton load-range depending upon the requirement of the unit that will be using the crane scale. The load cell used provides a special locking facility and is a striking safety feature to guard against sudden lifting of high impact loads. 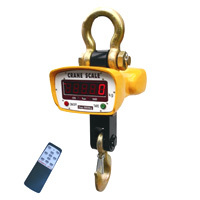 Convenience, accuracy and safety are three striking features of these crane scales. These scales are useful in Weighing scale applications process industry, Foundries industry, Transport industry, Metal industry, Steel industry, Cement Industries. The scales have super bright 1-inch red LED for clarity and ease. These models are durable in all environment conditions and can withstand temperature up to 1800 degree Celsius. Battery DC 6V/10A 1 PC is rechargeable. A 360-degree swivel hook is provided for convenience. It enables easy movement during weighing. Load cell connects to upper ring and bottom swivel hook of crane scale. It has got a non-screw design as per the dimension chart (with capacity and accuracy) to prevent loosening or breakage problem. Hanging crane scales are also available in several models and capacities to suit each weighing requirement.